Competing in the Kingston Dragonboat Race: Paddles Up Take it Away! Stepping on to the Dragonboat I began to think twice about volunteering to be the drummer for the race. The boat was rocking precariously as the rest of the 20-woman team loaded the boat. The drummer (that would be me!) gets to sit highest in the boat and, therefore, the second most likely to be ejected from the boat upon an unexpected jolt. The only person in more danger was our confident coach and steersman – or steerswoman I should say – Dana. As we pulled away from the dock the situation didn’t improve. The wind and waves from Lake Ontario made their way into the Inner Harbour and started hitting the boat from all sides. The rest of the women (including my own mother!) on the team ranged from 40 to 70 years old and did not seem fazed by the waves. 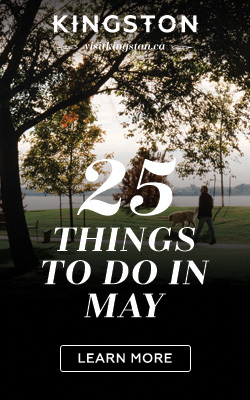 This was their fifth race of the season having already done competitions all over Ontario. A windy day in Kingston meant being the drummer was a little frightening! Their paddle out to the start line, though not even part of the race, was no walk in the park. Dana was already giving commands to the women who were dutifully acquiescing. As we approached the start line, the women seemed to all hold their breath; even though this was their fifth race they still got the communal jitters. As the air horn blew for the start of the race Dana immediately began screaming commands like a zealous football coach. The encouragement obviously worked, because the women started digging into the water like they were paddling for their lives! As we approached the finish line the women started to look winded but they kept hitting the water as long as Dana was yelling commands. The 2 minutes flew by and as we flew over the finish line the women tried to catch their breath. Unfortunately the other two teams – consisting of men and women of all ages from the Kingston community – had beaten them. Though they lost this race the true test would come later when they would race against the other all-women survivor team in the Survivor Series Challenge. Me and Jeanette after our race – Jeanette had the tough job! Leaving the dock, I felt so proud of these women. 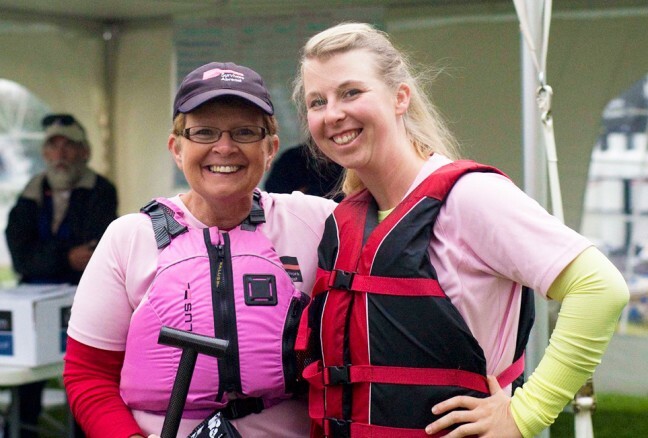 Every one of them is a breast cancer survivor who has chosen to participate in competitive Dragonboating so that they may enjoy the physical challenge and find camaraderie with other breast cancer survivors. After the race was over the women stretched and caught their breath while the adrenaline wore off. The Kingston survivor team – Chestmates – provided the Peterborough team – Survivors Abreast – with a handmade lunch of sandwiches, muffins and hot coffee. I was informed this was a dragonboating tradition; the home team always provides lunch for the away Survivor teams. The camaraderie between the teams is obviously just as important as the friendships within the teams. Kingston’s Chestmates Dragonboating team getting ready for their race. The other teams at the festival that day were from Kingston and Ottawa. 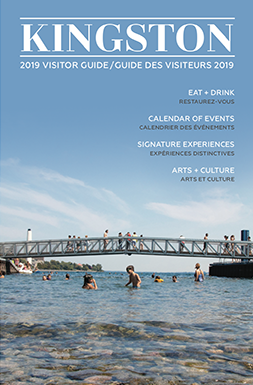 The festival serves as a fundraiser for local cancer research. 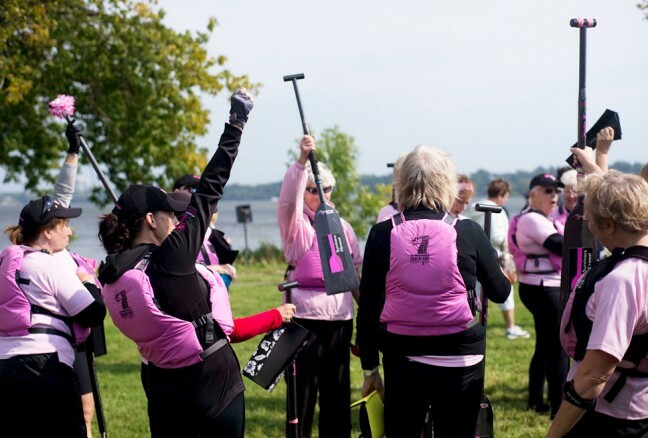 The paddlers all raise money for cancer research and then get to compete in the race against other recreational community teams as well as competitive all-female survivor teams from around Ontario. Community teams aren’t required to have any knowledge of Dragonboating as they receive two practices prior to the race. Community teams ranged from Queens to the Kingston Police Department who won the festival with the fastest time! 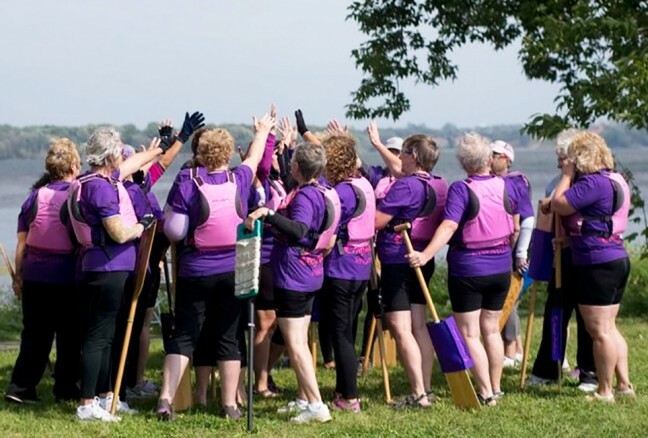 Survivors Abreast – my mom’s team from Peterborough – won the Survivor Challenge in an extremely tight race between the two Survivor teams. Survivor’s Abreast Dragonboating team in their race against Kingston Chestmates. 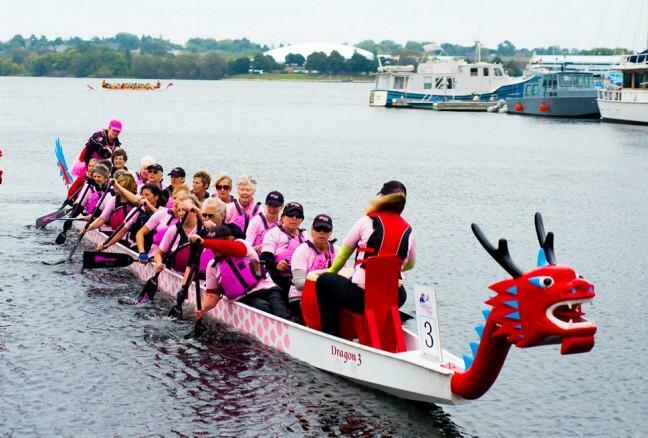 Both Survivors Abreast and Kingston Chestmates will be competing in the International Breast Cancer Survivor Dragonboat Festival in Sarasota Florida at the end of October held only once every four years. We’ll be cheering you on from Canada ladies! 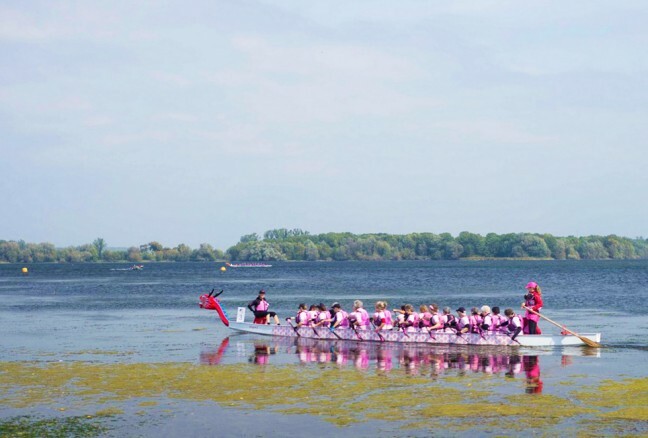 Survivors Abreast wins the Survivor Challenge in the Kingston Dragonboating Festival.